As you no doubt heard last night, the whole Facebook vanity URL grab thing was big. Within seven minutes of the service being available last night, 345,000 users grabbed one. Within 15 minutes, over a half million had, Facebook spokesperson Larry Yu told Bloomberg. But who got the best one. The best one I’ve seen by far, was grabbed by Christine Shipley of San Francisco. Rather than go for facebook.com/christine.shipley or even facebook.com/shipley, she went with facebook.com/default.aspx. Yes, her name could easily be confused as the default landing page for Facebook. (Though, savvy users will know that the site is actually built in PHP, and not ASP, which the .aspx extension suggests). Not surprisingly, people are already trying to sell their Facebook vanity URLs as well. The service Assetize, which we wrote about yesterday, already has 4 accounts for sale. The accounts listed are: cotman, pokerbook, sexybook and shekhar. The listing amount for each is “best offer” — none have any bids. But according to the service, one name has already sold, though it has to be bogus. Assetize just started partially blocking out names sold so you can’t see which ones were purchased, but I loaded the page earlier and saw that it was facebook.com/alex. Apparently, it sold for 99,999,999.99 — so unless it went to Alex Rodriguez, I say this buying and selling system is already broken. 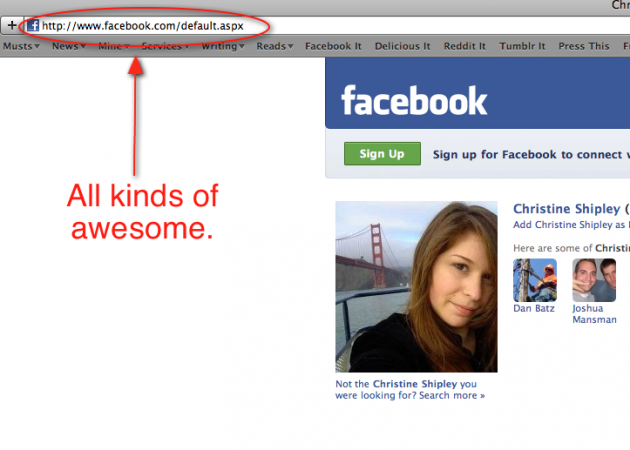 What else is odd about this is that alex is a 4-letter URL, which is against Facebook’s rules. So unless it was a Facebook employee who got the URL and was selling it, the whole thing seems to be a sham. Not everyone was happy with the results of the landgrab. Michael was one of the unlucky ones who didn’t get the name he wanted, even though he originally broke the story. Knowledge, it seems, isn’t always power.